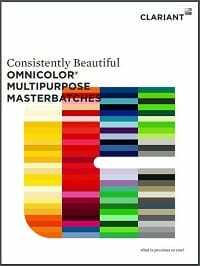 We are proud to be a Clariant Omnicolour® Masterbatch supplier. Clariant Plastics & Coatings are recognised as a world leader in colour and additive masterbatch solutions for plastics. Many major brands, manufacturers, designers and plastics processors around the world trust Clariant Omnicolor® to help enhance the market appeal or the end-use performance of their products. We offer next day delivery on all stock items for orders placed before 2pm. Our colour lab can provide masterbatch or pigment matched to any Pantone, R.A.L. or BS standard colours or to a sample supplied by you. We carry over 200 colours in stock so that you do not need to hold large stocks on your shelves and can order just the quantity you need for next day delivery. There is no minimum order on standard products. “I am pleased to say that your performance for on-time and complete delivery has been near perfect over the last six months making you one of our top 10 suppliers for the period of this first review. Colourmaster NIP Ltd, established in 1973 are a Clariant Omnicolor® masterbatch supplier and stockists of masterbatches, special effects, additives, raw materials, and more for the injection moulding and extrusion industry. Click on the image to download.